What options does your vehicle have? Windshields range in shape, size, tint, and features. Some vehicles that are the same year make and model have many windshield options. See below for the common windshield features and tips for identifying if you have them. There are a few easy ways to tell if your vehicle has a rain sensor system. If your vehicle’s windshield wipers turn on automatically, then your vehicle definitely has a rain sensor system. There is also a square panel where the rearview mirror is, but on the front windshield. Rain and light sensors can appear very similar. Cars can have one or both. 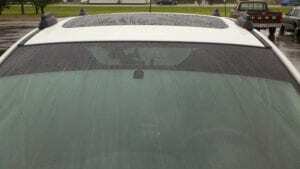 A rain sensor system turns the wipers on automatically by detecting rain on the windshield. A Heated Wiper Park area prevents freezing and slush accumulation in the area where your wipers rest at the bottom of the windshield. The lines you see are actually heated tracks that contain very small, thin wires. These lines are typically black, brown or red and can sometimes be hard to notice at first glance. Often, vehicles have a button inside the car that allows the drive to turn on this function. 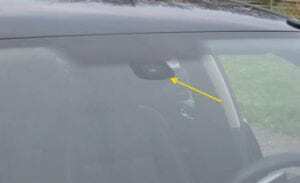 A windshield third visor frit is a black dotted section in your windshield behind or on top of your rear view mirror. Its purpose is to keep the sun out of your eyes while in the space between your fold down visors and roof. 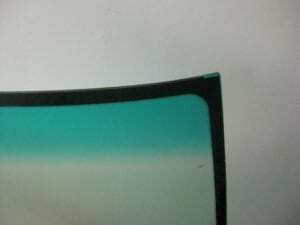 A shade band is a 3”-6” strip of darker tinted glass at the top of the windshield where it meets the roof. The purpose of a shade band is also to keep the sun out of your eyes. The difference is that it is a band of tint that runs along your entire windshield. It is often green and blue. This is not a standard feature. 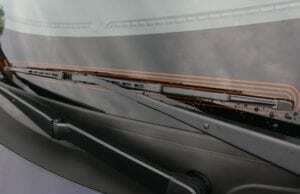 An electrochromic rearview mirror automatically dims when it detects light from behind the car. It reduces the glare that can create vision problems when driving at night. 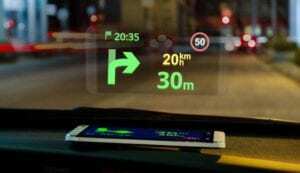 A Heads Up Display, or HUD for short, project data such as speed, temperature, navigation instructions onto the windshield so that drivers do not have to look away from the road. This allows drivers the ability to have important information readily available without taking his or her away from safe viewpoints. A Lane Departure Warning System is a mechanism that alerts a drive when they are changing between lanes without using a signal. 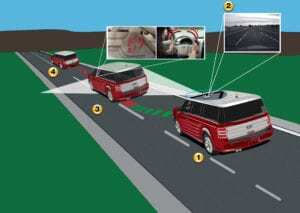 This function is controlled by camera attached to the windshield. 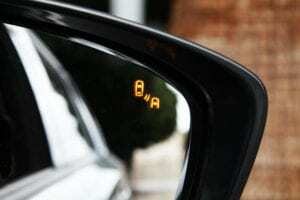 Blind Spot Monitoring is a sensor that typically appears on side view mirrors. The sensor will light up whenever there is a vehicle or object your blind spot on either side of your car. 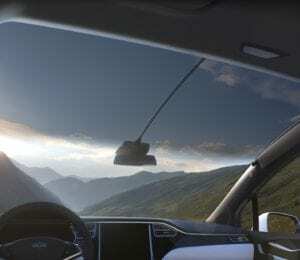 Solar Windshield Glass allows sunlight to pass through a window while radiating and reflecting away a large degree of the sun’s heat and energy. It is common in high quality windshields. The feature helps keep the interior temperature of your vehicle cool, while also protecting your eyes and resisting interior fading. Most vehicles will have somewhere in the range of 1 to 5 different windshield options, though the vehicle with the most is the 2014-2017 Jeep Cherokees with 23 windshield options! Jiffy Auto Glass technicians are well versed to install windshields with all auto glass features. If you have any questions, please do not hesitate to reach out to one of our specialists by calling (303) 876-0999 (Colorado) or (602) 427-1881 (Arizona).